The mixture of plastics used in many yogurt pots, ready meal trays and other containers limits the ability of councils to recycle them. The Local Government Association says that only a third can be reused. The rest get sent to landfill. The plastics industry said it was committed to reducing waste. The British Plastics Federation said firms needed a financial incentive to choose more recyclable plastics. The LGA says the government should consider a ban on low-grade plastics. According to the LGA analysis, around 525,000 tonnes of plastic pots, tubs and trays are used by households in the UK every year, but only 169,000 tonnes of this waste is capable of being recycled. It blames producers for using a mix of polymers, some of them poor quality. The LGA, which represents councils in England and Wales, says that some simple tweaks could make a massive difference to this situation. It points to microwave meals which are often supplied in black plastic material. However, black is the only colour that can’t be easily scanned by recycling machines, meaning that process becomes unnecessarily complicated. Changing the colour of these items would significantly increase the amount that could be used again. 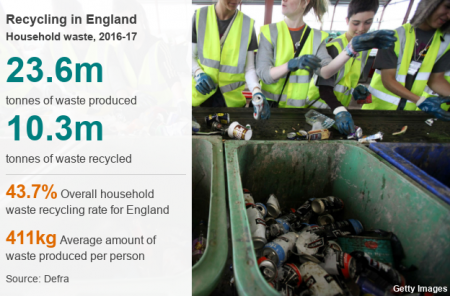 “It’s almost criminal to think that some of the plastics being used are difficult to recycle, and black plastic is almost impossible to recycle,” Cllr Peter Fleming from the LGA told BBC News. When it comes to punnets of fruit and vegetables many are made from up to three different types of plastic, including polystyrene, which can’t be recycled. Margarine and ice cream tubs: Often contain the polymer polypropylene which is very difficult to recycle. An alternative approach would be to make them from the same plastic as water bottles which is easily re-used. Microwave and meat packaging: The materials can be recycled but need to be sorted via an optical scanner first. However, as they are predominantly black this makes the process difficult. A simple change of colour could lead to a real increase in recycling. Fruit and vegetable punnets: A complicated construction often sees three different polymers used. Simpler designs and more use of recyclable materials could make a big difference. Yoghurt pots: Often made from a mixture of polypropylene and polystyrene, which are difficult to recycle. An alternative is to use polyethylene terephthalate, which is also used in plastic bottles and can be easily recycled. Baked goods trays: The lining on these trays for cakes and baked goods is often made from difficult to recycle materials. Other options are available which could boost recycling numbers. The LGA wants plastics manufacturers to work with councils to prevent materials that limit recycling entering the system in the first place. It is also calling for government to consider banning low-grade plastics, particularly those for single-use items. “We need an industry-wide, collaborative approach where together we can reduce the amount of material having an impact on the environment,” said Cllr Judith Blake, who is the LGA environment spokesperson. As well as calling for a ban, the LGA is looking to the government to make plastics manufacturers pay for the costs of collecting and disposing of plastics that can’t be recycled. Keith Freegard, from the recycling group at the British Plastics Federation – the leading association for the whole of the plastics industry – said designers often use the colour black for packs to indicate they are a more “top of the range product”. He said the industry was already trying to find ways to use more recyclable packaging. The LGA report comes hot on the heels of a study from the National Audit Office that suggests that half the packaging reported as recycled is actually being sent abroad to be processed.